Law enforcement officials are seen near Washington Boulevard and San Pedro Street in L.A. regarding a man wanted for allegedly stabbing another man on Wednesday, Sept. 13, 2017. 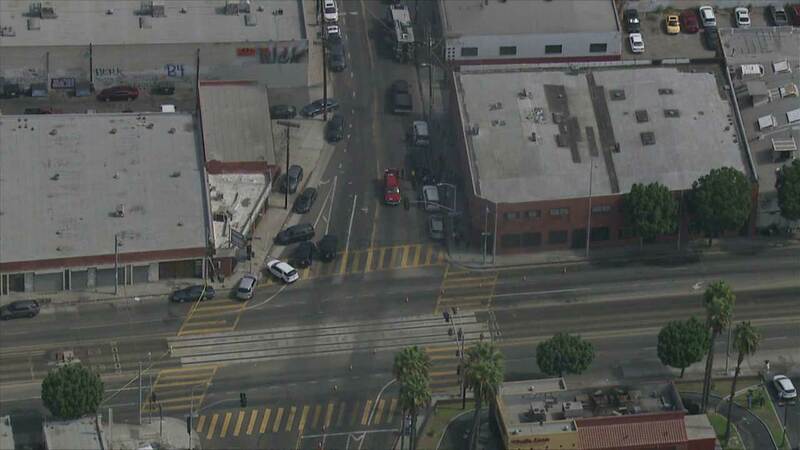 LOS ANGELES (KABC) -- An hourslong barricade situation ended Wednesday afternoon after a man who allegedly stabbed another man with a sword was not in the apartment at the center of the standoff in Los Angeles. It all began around 3 a.m. when a woman was walking with a man to her apartment. Police said the sword-wielding suspect came out of the woman's residence and stabbed the man she was walking with. The suspect then returned to the apartment, triggering the standoff. The Los Angeles Police Department's SWAT team surrounded the apartment, located near Washington Boulevard and San Pedro Street. Past noon, investigators discovered that the suspect was not inside the residence. The stabbing victim was taken to the hospital. His condition was not known. The incident caused delays on the Metro Blue Line, but service returned to normal after the barricaded ended.